We've been in the playset business since 1992, and our design engineers have many years of combined experience in designing safe, innovative, and sturdy playsets. From inventive product development to superior customer service, Gorilla Playsets is the first name in ready to assemble playsets. Gorilla Playsets has taken the playset industry to new heights by going beyond the ordinary features and play value found in typical swing sets. At Gorilla Playsets, we listen to our customers’ needs and continually strive to produce playsets that will be safe for your children. We made adjustments and re-structured certain aspects of playsets that needed a modern re-design, and we made them better! We learned from you, and we listened to your children. Everything you need is included in your play set kit at your time of purchase, including hardware. A manual is also included to help you during set up. We try to answer all of your questions before you even ask! Each swingset is pre-drilled, pre-stained and pre-sanded to eliminate any prep-work for you! All of our swingsets can be built using everyday tools! No special tools are required, since each beam is pre-drilled and the swing sets come with all hardware you will need. A list of the required tools needed can be found here. If you prefer to let us assist you with the play set build, Gorilla Playsets can send a representative to your home for a hassle-free installation. Find out more about the installation process and locate your local installer here. 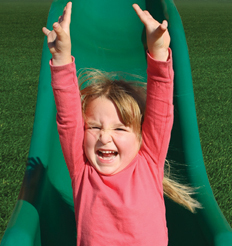 Gorilla Playsets boasts one of the best warranties for swing sets in the industry! We offer a 10 year limited warranty on wood and structure components, and 1 year warranty on all accessories. Each set comes with warranty details and maintenance care suggestions to increase the longevity of your set (such as weather proofing. More tips can be found here). We will repair or replace anything that is defective or missing from your set. If you have warranty questions, just give us a call! Learn More! Gorilla playsets are built with choice grade, quality lumber to keep your playset healthy and safe for many years! All lumber is hand-selected for its strength and durability. Find out more about our lumber here. Your child's safety is important to us, that's why Gorilla Playsets is the industry leader when it comes to safety and innovation! Features such as safety coated swing chains, commercial grade hardware, wide and flat ladder steps, self-reinforced slides, and 4x6 swing beams have made our swing sets some of the safest available. Find out more about how we're keeping your kids safe here.